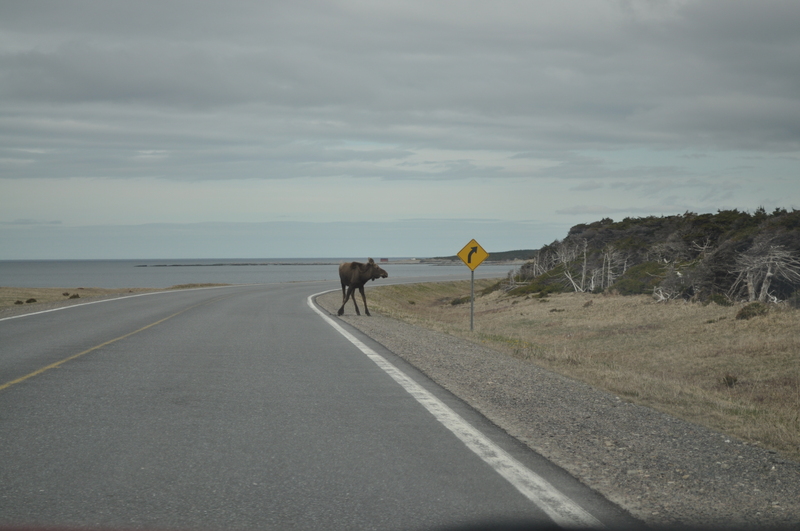 On a recent drive up the Great Northern Peninsula, past Gros Morne National Park en route to my hometown as a passenger I was able to snap a moose abiding by the traffic laws. In the first image the moose does not realize he should turn and is thinking of making a dash across the highway. Something clicks and he catches the sign and realizes he most likely should turn. He opts to return to the forest. The Great Northern Peninsula has an abundance of moose, most likely there are more moose than people. During the prelude to the beginning of the tourism season, I have seen more moose on or near the road than vehicles when driving the highway. If you are interested in seeing wildlife, such as moose or caribou, the Great Northern Peninsula is a gem. Especially, Roddickton (Moose Capital of the World) or drive from Eddies Cove East to St. Anthony. However, be cautious as not all moose use the same judgement as this one; they have been known to reek havoc on our highways. Each year signs are posted noting the number of reported moose vehicle collisions on Route 430. This number was nearing double-digits the last time I passed the sign. The Viking Trail, Route 430 on the Great Northern Peninsula is your premier destination if you want a serene scenic drive with a high likelihood of catching a glimpse of a moose, caribou or even an iceberg! Experience the Road to the Vikings this summer on the Great Northern Pen! 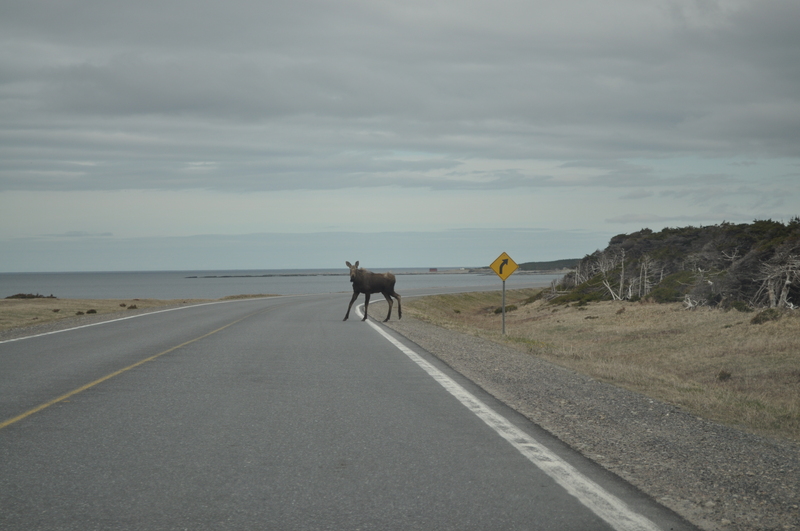 Posted on June 12, 2011, in Landscapes/Geography and tagged canada, Great Northern Peninsula, Gros Morne National Park, Moose, Newfoundland & Labrador, Roddickton, Traffic collision. Bookmark the permalink. 4 Comments. Yes it’s sad to know there are more moose on the N.P.V.T.than human beings BUT the Government ‘s moose take the lead.How can this be permited? When you apply for amoose lic. and get your reply unsuccessful it’s a LAUGH.SO LET THE MOOSE LIVE & HUMANS DIE.WE CERTAINLY HAVE SOME SMART PEOPLE OR IN OTHER WORDS TOO SMART. I agree with you Hazareth. I have heard a few people were unsuccessful in their bid to obtain moose licences locally. There needs to be better management, which will fall upon the Government. I do not have the information regarding population, licence distribution and applications. It would be an interesting study. I wonder if there has ever been a Compliance Audit on the Moose license lottery? There a further measures the Government needs to take to control the Moose population. They had announced increased moose licences, a cull of moose at the National Parks (although quite small in numbers) and additional highway grooming. Ultimately, more can be done. Other provinces have implemented moose fencing. For Newfoundland & Labrador this could be a costly endeavour. It will be interesting to see what the outcome of the Class Action Lawsuit agains the Province for those injured by moose-vehicle collisions.